Kaestner Auto Electric features the Axios™ Customizable Light Bar made by ECCO®. Axios is the first Modular LED Lightbar System! 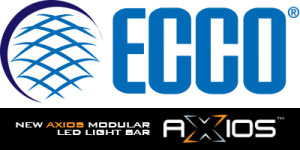 We are the only ECCO® distributor in Wisconsin that can build the modular light bar systems on-site to your specifications with zero lead time! Or we can assemble your light bar at our shop, and quickly ship or deliver it to your location. We will deliver your light bar throughout Waukesha, Milwaukee, Racine, Kenosha, Ozaukee, Sheboygan, Jefferson, Fond Du Lac, Appleton, Beaver Dam, Washington County, Dodge County, Dane County, and Janesville! If you are looking for new truck light bar options, or looking for off road vehicle lighting—go with quality! Choose Kaestner to build your new Axios Modular LED Light Bar to the required state specifications, within your budget, and to your preferences. Talk to Kaestner today to get a customized Axios™ Light Bar installed on your vehicle or vehicle fleet! Towing companies, Municipalities, as well as Fire, Police, and Construction Companies have trusted Kaestner to assemble, install, and/or deliver their Axios Light Bars by Ecco. We custom assemble each modular light bar to the needed specifications. Call Kaestner at 262-547-9600 to order your Axios Light Bar today!